Right-click the selected item and click Create Disk Image command from the context menu. Additional areas on other disks can be selected in the Physical Disks list to be processed simultaneously. At least one selection must be made to begin disk image creation. Use markers that indicates the first and last sectors on this control to specify an area to image. Provide location of Disk Image configuration file. To browse to the path, click the ellipsis button […]. All Disk Image chunk files will be created in the same folder with DIM file. Enter a brief description about this disk image for future reference. Optional. If this option is set, all chunk files will be replaced with a new once if their file names are the same. Ignore Read and Write errors during the disk image creation. None [Raw Data] - No compression is applied, sectors are stored in raw format. Fast - Sectors are compressed before storing to the file using a fast compression algorithm. Medium - Sectors are compressed before storing to the file using a slow but more effective compression algorithm. Click Create Image to initiate disk image creation process with selected parameters. To terminate the process, click Stop at any time. Results may be not accurate or complete. The file extension for a Disk Image configuration file is .DIM by default. 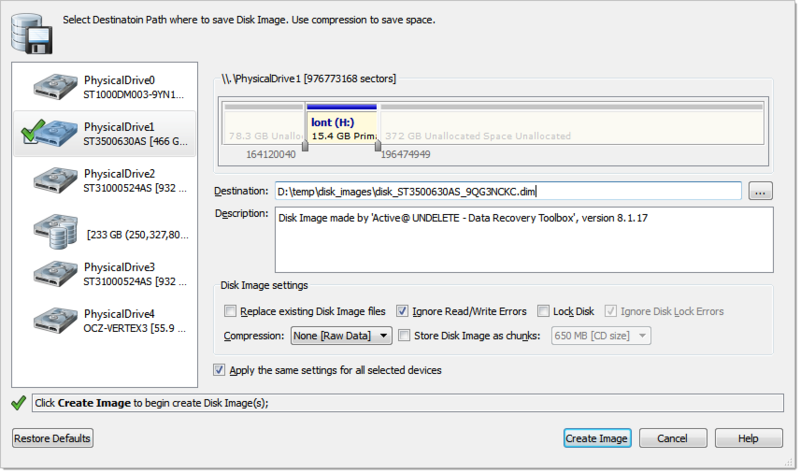 Use Create a Disk Image Wizard for the same purpose.